The ply arrived within days of the order being placed and within 1/2 an hour of the promised delivery time! So now it's time to convert 12 of these 8'x4' sheets into 4 off 24'x4'. 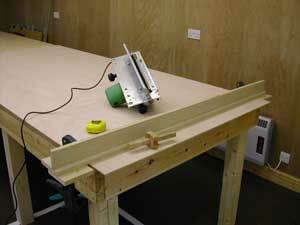 The first thing you need is a scarffing fixture that sets the depth of cut. You'll notice I've extended this past the edge of the sheet to provide support for the saw at the beginning and end of the cut. This is particularly important when you're using a large circular saw, this one's 235mm and 7.1kg! Preparing 12 sheets which is 16 scarffs took a little over 2 hours. Time to mix some glue. The resin system I'm using is SP106 with the slow hardener. Applied un-thickened to the scarff on each board followed by a thin skim thickened with microfibres before the joint is closed, followed by peel ply and release film under the pressure plate. Ok... 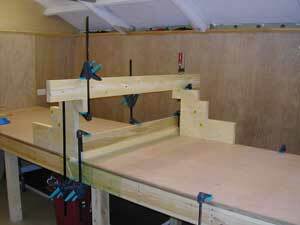 So the structure looks a little 'Heath Robinson' but it does the job (and consumes all my clamps). 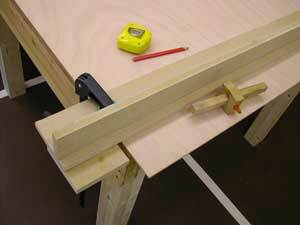 It just shows, that until the job's finished keep all your off cuts, you never know when they'll come in handy.